CLICK HERE to Enrol in this Online Course. The aim of this Session is to give you a broad brush overview of the Go Food Gardening System that you’ll use to grow bigger and better herbs and veggies. You’ll also get a handy flowchart of the system that you can use as a plug-and-play template to develop your own food gardening skills and knowledge. And there’s a food gardening skills assessment that will help you remove the limiting factors… Remember Liebig’s Barrel? Solomon the Wise said: “Where there is no vision, the people perish.” The same goes for your food garden. In this session we introduce you to six activities which will help you define your overall food gardening dream and what you’ll need to reach it. The activities also help you to go beyond conventional organic gardening to gardening with a high positive and low negative social and environmental impact. If there are any real secrets to growing bigger and better crops, then composting would probably be at the top of the list. In this session you’ll discover the importance of compost for growing bigger and better crops; and you’ll get step-by-step instructions to set up your own composting system. The biggest reason for failure in conventional food gardens is lack of planning. 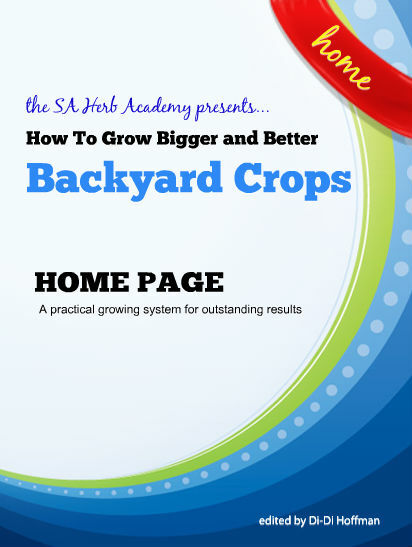 In this session you’ll learn a rather comprehensive planning approach that leaves nothing to chance and ensures the best possible harvest from the available growing area. You’ll start your planning with the position and layout of your various food gardens. Next, you’ll decide on the crops you want to grow using a predefined set of criteria. You’ll set portion goals for your crops and you’ll plan exactly where and when each crop needs to be sown. Armed with your Food Garden Layout and Crop Planning Worksheet from Session 4, you are just about ready to rush off to the garden centre to purchase the seeds, seedlings and plants for your food garden. But before you do that, it’s essential that you take the necessary steps to ensure a well-prepared fertile soil in your planting beds. The amount of soil preparation you need to do will depend on the conditions in your garden. But as you’ll learn, rather err on the side of doing too much than doing too little. There are five possibilities for starting your crops: sowing seeds, buying seedlings, rooting cuttings, dividing plants, or buying plants. The principles of successful sowing and plant raising are the same for almost everything you will grow, so once you’ve mastered the principles of plant propagation we share in this session you’ll be able to sow and raise a large number of plants for your garden. With the crops in the soil it is time to start watering, fertilising and managing pests and diseases until your crops are ready for harvesting. In this session we’ll introduce you to the four Go Food Gardening cycles that helps you become a successful and productive food garden manager and care taker.